From EWTN Home Video comes a collection of shows from the series that helped launch an entire global network. 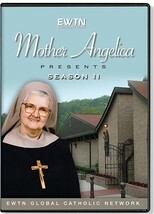 See some of the earliest broadcasts of the Eternal Word Teelvsion Network in Mother Angelicas series, Mother Angelica Presents. Featuring Mother Angelica relaying her wisdom, humor, humility and tremendous faith in front of alive audience, Mother Angelica Presents covers issues that remain as relevant today as they were during the shows' original broadcasts. Hear Mother discuss the Scriptures and tackle topics that affect our lives every day, as she urges all of us to trust in God.